Myrobalan Extract 100 gram pack – a natural substitute for Tannic Acid in dyeing wool, cotton and silk and mordanting cotton - SAVE £2.50 over the 20 gram price of Myrobalan extract. When used on its own myrobalan extract produces beiges on wool, cotton and silk. With an iron after-bath, the colour changes to greys and black. 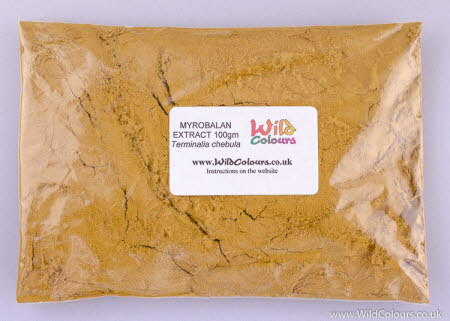 Myrobalan extract can also be used to sadden other colours. Myrobalan Extract is weighed and sealed in a polythene bag. The bag is then labelled, placed in a padded envelope and posted to you First Class.